Knowmad Adventures was born from the idea that travel makes us better people. We make creating your own authentic and innovative trip stress-free, ensuring that travelers are able to experience, enjoy and grow. Since day one we’ve been dedicated to the highest level of customer service and traveler satisfaction. Our values of authentic travel, a spirit of fun and adventure, and a profound respect for the cultures and environments that we visit have helped us connect with an incredible community of travelers from around the globe. Working with this community is our greatest privilege, and hearing excited travel tales upon their return our greatest joy. These are a few of the talented and dedicated Knowmads who look forward to helping you have your perfect experience in South America. While studying abroad in Chile during high school, I became hooked on international travel. 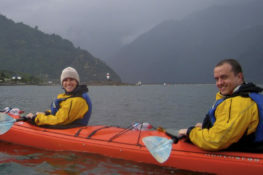 This addiction eventually led me to sea-kayak guiding in Alaska, teaching in Thailand, traveling through most every nook and cranny of South America, working for an adventure race in Patagonia, and guiding trips in Chile and Argentina. Travel brought me incredible experiences and challenges, highlighting the world’s natural beauty while connecting me with inspiring people. Ultimately I became convinced that travel makes us better people, and better people make a better planet. Having been born with a substantial wanderlust tick, I’ve been perpetually focused on the next great adventure. Hopping a flight to some far-flung destination doesn’t have me skipping a beat – I’m endlessly inspired by the cultures, food, colors, and idiosyncrasies I discover. Ironically though, part of what I take away from travel is a deeper sense and appreciation of home. Gaining new perspectives abroad gives me a fresh outlook on my day to day. Here in Minneapolis, I strive to live locally, while thinking globally. I feel so lucky that Knowmad has enabled me to be a part of people’s life journeys. Born and raised in Boise, Idaho, I moved to Washington state after high school to study Visual Journalism, Anthropology and Spanish. After traveling through Central America and studying abroad in Mexico during college, it did not take much convincing for me to pack my bags and move back south after graduation. After over 3 years of living in Guanajuato, Mexico, I truly discovered what it is I love about travel; culture and language. New experiences and especially exposure to both different countries and cultures can have a profound, irreversible impact on someone’s life. I love this. Whether it be returning from your trip with a new sense of adventure, a new self confidence or just a new friend, refreshed outlook or way to think about your daily routine, travel has a unique ability to get into someone’s heart and mind, and then stay there forever. It certainly has for me, and I feel both excited and honored to be a part of that experience for Knowmad travelers! After falling in love with Spanish at a summer camp more than 20 years ago, I studied it in college and ultimately became fascinated with exploration and adventure. I have lived in six countries on four continents and visited more than fifty countries. Today, you’ll find me back in my home state of Minnesota where I love sharing my passion and knowledge of travel with others. I’ve always had a thirst for travel and adventure but studying abroad in Spain during college ignited my love affair with the Spanish language and Latin culture. This only grew as I spent four years after graduation exploring South America, first as a solo backpacker and then planting roots and living in Quito, Ecuador. Since then, I have returned to the region over a dozen times, swimming with penguins in the Galapagos Islands, horseback riding in Torres del Paine National Park, stargazing in the Atacama Desert, river cruising through Peru’s Amazon jungle, picking coffee beans alongside coffee farmers in Colombia, and eating one of my all-time favorite meals in the vineyards of Mendoza’s Uco Valley. I am endlessly inspired and humbled by the people and places of South America, and I can’t wait to help you experience it! These days I am based in New York City and I am constantly on the lookout for new adventures both here and afar. After growing up in Minnesota, I moved to Chicago for college, where it quickly became my second home and where I absolutely fell in love with exploring new cities! I studied abroad twice during college, in Siena, Italy, and London, England, and I went on two backpacking adventures to Europe & Central America with friends during those years as well. Those trips, along with the rest of my travels, have significantly furthered my love of exploring and adventuring. Traveling is so dear to me because it gives you the chance to learn about the stories of people who call someplace else home, to listen to different and beautiful languages, and to be present in places you’ve only ever seen in movies, read about, or dreamed of visiting. These days, I’m having a blast exploring all the things that make Minneapolis and St. Paul so awesome with mini, local adventures, and still very much collecting as many travel memories as possible! Being born and raised in Minnesota I always had a knack for adventure. I spent my life outdoors whether it be camping as a kid or becoming a canoe guide on the North Shore. I expanded this passion for adventure to an international level while on a band trip to Costa Rica which led to me studying Spanish in college and, ultimately, living in Argentina and Peru. Some of my favorite adventures include backpacking through Patagonia, camping in Bavaria, and sand duning in Ica. I believe that travel has a way of pushing us out of our comfort zone, expanding our perspective beyond what we know, and helping us to grow. I am an outdoor loving, food enthusing Minnesotan. Attracted to the culture, language and mystery of South America, I chose to study abroad in Buenos Aires, Argentina in 2012. After living with a family and traveling in my spare time, I can safely say I feel a sense of home in South America. I am a graduate of University of Colorado – Boulder with a degree in Anthropology and certificates in Technology, Arts, & Media, and Entrepreneurial Business. I believe that life is a rhythm and development and travel has encouraged me to expand my perspective and grow. My passion for culture and exploration was only strengthened while living abroad and today I continue to live my next adventure. Growing up in rural Alaska made travels large and small seem like a big adventure, so when I left my home state to attend music school in Hartford, Connecticut I was eager to make traveling a priority. In college I studied and lived in a Buddhist monastery in Japan, and have also spent time in India. These days, I enjoy the trek home a few time times per year as well as exploring new destinations. Traveling can be a chance to learn about the world, humanity and ourselves by experiencing it all from a new perspective. As a musician, I always make a point to hear local music when I travel, and I savor the opportunity to bring home new memories and a new lens on life. After growing up in Minnesota and marrying my high school sweetheart, I studied at the University of Minnesota. Since 1993 I have worked with a variety of small businesses, and thrive at getting in the trenches in order to offer experienced business and accounting advice and solutions. I have traveled extensively, and going with my husband and two children to places where we can see and learn things we can’t at home and experience culture is one of my greatest joys. I’m from the UK and have over six years’ international experience in hospitality, tourism and allied industries. Ever since the first time I visited Chile, I have been enchanted by all that it has to offer – breathtaking scenery, world-class outdoor sports, internationally-recognised wine, great food and of course warm and generous people. After frequent visits, I decided to leave London for Santiago in 2014 and love being able to share my passion for Chile on a daily basis. As Knowmad’s head coordinator, I am in charge of managing guides, transportation, hotels and other travel needs. I am also fortunate to experience our services first-hand to be able to provide expert insight. 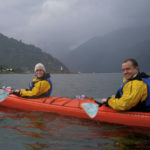 During your time in Chile, I work to ensure that you have a trip of a lifetime. 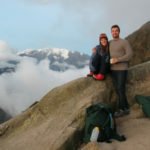 I have been building adventures for guests to Peru for over 13 years. Although it’s a full-time occupation, it’s better described as a hobby than a job as surpassing traveler expectations and watching people leave with a deep love and respect for my beloved Peru is both rewarding and fun. I feel very fortunate to be Peruvian; having traveled to many countries throughout the world has only heightened this feeling as Peru not only has breathtaking landscapes and astonishing archeological remains, it also has a warmth and kindness unique in the world. It’s not uncommon for me to hear our travelers report that of many trips worldwide, their experiences in Peru are some of the most special they have had. The feeling I get when I hear this reminds me that I can’t imagine doing anything else. Ever since I was a child I was interested in tourism and in visiting different places, interacting with people from different cultures and languages. That’s why this year I left Lima to come and work in Cusco, where one of the 7 wonders of the world is located, Machu Picchu! I love my job and I am easy-going, empathetic and adventurous. I like hearing or reading about mystical histories and I also like singing and dancing. I love suspense movies, but hate horror movies. I love volleyball, all kinds of desserts, and cats. I was born and raised in Quito, Ecuador. I am very proud to live in a bio diverse country, full of natural resources and ecosystems. I have over six years of experience working in the tourism industry from travel agencies to tour operators and airlines. I have had the opportunity to travel throughout Ecuador, falling in love with this small country, filled with cheerful and friendly people who look forward to sharing their culture and history with visitors from around the world. My personal goal is to provide people with unforgettable experiences that they’ll cherish for the rest of their lives during their visit to Ecuador. Originally from France, I came to Argentina planning to travel and discover for around a year. That was eight years ago! I feel in love with Argentina and Patagonia after traveling the country from North to South. After working in the luxury hotel industry, I became a Travel Coordinator as I most enjoy sharing this paradise that is Argentina and helping people have unique experiences discovering the diversity that exists here, whether that’s reaching an unexllored area of the altiplano at 13,000 ft, or simply having a great conversation with a local over a glass of malbec. Outside of travel I enjoy playing the vilolin, cycling through Buenos Aires, and eating amazing food. I was raised in the fields, mountains and hills of Buenos Aires and Mendoza, Argentina. I now reside in Salta where I’ve lived since 2010. 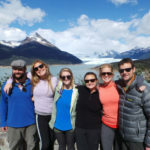 I work as a bilingual guide in Salta, Mendoza and Patagonia. I identify not with one job or passion but with many; I am a guide, a gaucho, a horse breaker, a mountaineer and more. I also have a lot of experience and training in first aid, life saving and rescue. My biggest passion is horses because they have been a part of my life since childhood. I love to teach and share my knowledge and experience with others as well as share the beautiful places, traditions and culture that I know. My office is nature and my roof is the stars. Carolina has been involved in the Chilean wine industry for 8 years, starting as a guide and learning everything she could straight from the vineyards and the winemakers themselves. After realizing how much she loved the wine industry, she began her studies at the Sommelier School of Chile to expand her knowledge of wine and spirits. Since then, she has worked in some of the most important vineyards in Chile, including Emiliana Organic Vineyards and Almaviva. Passionate about food and wine, she also spends time working in the best restaurants of Santiago by providing a wine pairing service according to their menus. Carolina loves outdoor life and traveling. Some of her favorite activities are hiking, trekking, and mountain biking, which she learned while living in a National Park in Canada. She has also traveled through South and North America, and Southeast Asia. Very charismatic and easygoing, Carolina loves to get to know her travelers and their hobbies and interests, so she can provide them the best experience when they visit Chile. Mark has traveled the world racing and guiding on bicycle, training with local teams, meeting great people, and enjoying many beautiful places. Mark chose to settle down in the heart of Chile in 2005, after a three-month cycling adventure through the country in an effort to share information on the health benefits of cycling. Mark is dedicated to increasing the popularity of an active lifestyle in Chile and to bringing the world closer to all of Chile’s natural beauty. Mark will be your guide from start to finish. With more than twenty years of experience in the cycling industry, coaching and race development, teaching, and nutrition studies (not to mention culinary arts) you will be in good hands on your cycling adventure. Manuel has lived abroad for almost twenty years, both in South America and Australia, and this contact with various cultures and languages has given him valuable firsthand experience and a rich view of the worid. Manuel has also travelled extensively in Europe, Africa, Middle East and the US. Being so passionate about travelling, meeting new people, and exchanging views about different countries, he has devoted himself to working with travelers from all over the world for the past fifteen years. He has also become an excellent wine connoisseur. His professionalism and understanding of the travel industry, together with his charismatic personality and enthusiasm towards his work ensures Manuel’s travelers a service of prime quality from beginning to end. Daughter of a Chilean father, an American mother, and granddaughter of American archeologist William Mulloy who is responsible for the majority of archeological restoration on the island, Josie offers unique perspective, insight, and personal history to Easter Island. After growing up and receiving an education in the U.S., she relocated to her father’s homeland and shortly thereafter received ‘Top Guide of the Year’ in all of Chile. 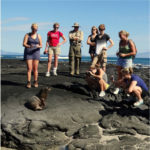 She is regarded not only as the most insightful guide on the island, but the most fun as well and she looks forward to sharing the mystery of Easter Island with you. Wilfredo was born and raised in Cusco. After graduating from the San Antonio de Abad University with a degree in Tourism Administration he continued to pursue his passion for music and travel. He has been guiding treks and tours in the Cusco area since the 80’s and has probably been on the Inca Trail over 250 times! When Wilfredo is not guiding tourists in Cusco, he is designing and manufacturing traditional Andean musical instruments, which he exports to various countries around the globe. Wilfredo is also an accomplished musician. He plays a variety of instruments including the quena, zampoña, charango and percussion and has performed in concerts in several cities in the United States back in the 90’s. He also has a wide-ranging knowledge on Peruvian culture, society, and politics in addition to insight into Peru’s unique flora and fauna. I was born in a small community 8 hours from the city of Cusco. When I was nine years old, I moved to the Incan capital where I attended elementary and high school at government-run schools. I later went on to achieve a degree as an official guide in Peru. 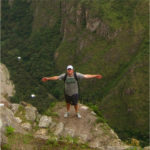 My first language is Quechua, I then learned Spanish in Cusco, and later learned English at a private language school. I have been working as a guide since 2004. My personal mission is to be a part of the families that come from far away to see our wonderful country, people and learn about our culture. I have to say that I am so happy to share my culture with you and I know you’ll leave the country having felt like you’ve met more than just a guide, but now have a brother from another country.